B How can I calculate the force of a falling object? Today I was thinking how would I calculate the amount of force I would experience if I were to jump out of a second floor building in the event of a fire and if I had to jump how much force would be applied to me? I was able to find the height of the building by dropping an object from rest out of the window and found that the object hit the ground 1.63 seconds after dropping it. d=vi*t+.5at^2 and I was able to calculate the height of the building to be 13.03 m which seems reasonable. I then went to calculate force and I only have the formula F=m*a which I know my mass is around 67 kg and my acceleration would be gravity. But this force is 657.27 N which is the same as the force of me standing on the ground. I then decided to try and calculate the work done on me by the ground and my kinetic energy which then produced values of 8564 Joules and 8576 joules respectively. However this does not tell me the force at which I would hit the ground. It only tells me the energy I would apply to the ground supposing I remain inert when hitting the ground and conversely the energy that would be applied to me when I hit the ground. I just want to know how much force I would hit the ground with and I cant seem to figure out how much force that would be. I know I would hit the ground with a final velocity of ~16 m/s and I know the acceleration is due to gravity and I know the time I would fall is 1.63 seconds but I cant find a way to calculate the amount of newtons that would be applied to me. And I know my acceleration is not going to change when I fall. But I also know from my lived experience that when I hit the ground falling from 13 meters I am going to be in much more pain than when I hit the ground falling from say 1 meter. In short how can i calculate the amount of force I would hit the ground with because it seems I can find the velocity I hit the ground with, the amount of energy I would apply to the ground and thus the amount of energy the ground would apply back on me but I cant find the force that I would smack the ground with. Suppose you accumulate a velocity, V, as you fall. Also suppose you land on your feet and your center of gravity is 3 feet above the ground. If you smash flat, you would decelerate from V to 0 within 3 feet. You can work with that to calculate an acceleration (a deceleration is a negative acceleration) if the acceleration is constant over that 3 feet. That can be turned into a force. You have not given a mass to calculate the force. It is probably better to express the acceleration in Gs and leave it at that anyway. Ok, to interpret this formula should I interpret the impulse as how long the force is applied to my body or how long my body would be in free fall motion and then stopping when I would hit the ground. I imagine the impulse would be the duration of how long the force would be applied to my body and if this is the case how could I possible interpret that? It would seem that if I were to hit the ground the time would be from when I hit the ground to when I stop moving toward the ground and the reaction force would be done being applied to me, which still cant be reconciled in my brain because the reaction force will be applied no matter what. Im at a mental pretzel. In response to fact checker, that seems like a good idea. Only how long would this deceleration take do you think? I am assuming .1 seconds and that would then result in a 10,720 N force being applied but I have no idea how I could interpret this. I guess my reverse ask is how do I know how long that force would be applied assuming I act as an inert object. I am not looking to complicate this by assuming I bend my knees and roll out of this motion because that would increase the duration of the force being applied. You are interested in the force from the ground. So the time is from the moment when you first touch the ground until you (including your internal organs) come to a complete stop. Thank you Dale! That is how I imagined it would happen. So what do you think would be a good estimate for this hypothetical situation? That can vary a lot depending on if you are landing head-first, feet-first, flat, and on concrete, air cushion, net, etc. It's possible to get extremely high rates of deceleration (thousands of g) if you drop steel onto steel because both are hard so the stopping distance is very short. If you landed upright with rigid legs and a straight back how much would they allow your body to compress before stopping? Perhaps a few inches? If you land on your head that might stop in a very short distance/time while the rest keeps moving. You will have to make some assumptions. The Impulse (force times time) is the change in Momentum and the momentum on impact is the same in both cases. The point about the impulse is that, if the time is longer, the force is less. A soft landing provides a longer contact time so the force can be (acceptably) lower. Take a body of 90kg mass (average to large man) and drop him 30m. Over that distance, there is a force of 90g (g doesn't stand for grammes) (=900N) on him (g=10N/kg - near enough). You don't need to calculate the actual Kinetic Energy the body has, on impact - just equate the work done by gravity with the work done on the air bag. 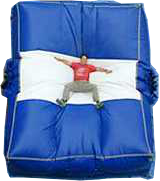 If the air bag stops his fall in 1m then the ratio of the forces will be the inverse of the ratio of the distances. or, alternatively, the acceleration (deceleration) force from the air bag would be 30g. Perhaps OK for a single impact but that off the head value of 1m was perhaps a bit short and 30m is a high fall. Increase the braking distance to 3m and the force goes down to 9000N and the gForce goes down to 10g. This all assumes constant force on the body. The peak forces involved could be higher but the method is good for ball-park figures. "How can I calculate the force of a falling object?" You must log in or register to reply here. Related Threads for: How can I calculate the force of a falling object? Question about the force of a falling object. Force of a falling object.